Ok so maybe it is an anole or some such. I call them all Geckos unless I know better. They're all OVER the place here and that is exactly how I like it. I walked outside the other day and was going for a walk to the shops on Wilton Drive, and looked at the back of the Jeep. 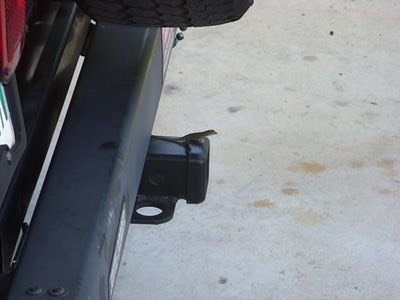 There on the trailer hitch was this little critter watching what I was up to as if to say "Hey Dad! Where are we going?". More likely, knowing how skittish they are, the little guy/girl was thinking "Who is this Moose and if he comes any closer I know I can hide in the hitch". I did, and so did he but not after I got the one picture. Either Way, I'm fine with it. I can see them climbing all over the yard and the house flicking their Dewlap at me in a territorial display or ducking for cover. That particular one is one of the "Daytime" geckos. The "Nighttime" Geckos are pink and translucent and remind me of their vampire cousins. We have the Curly Tails back now and they're just dumb and aggressive. I had one try to gum my shoe the other day which was as funny as it was sad. For now, this little guy is safe. I don't know if he took up permanent residence in my trailer hitch, but since I don't move the car often he's welcome to it.